We’re very pleased to announce Homework II: Long Forms / Short Utopias, a three-day conference and collaboratively-written publication that will aim to unfold the ways in which we construct, articulate, and practice ideas of micro-utopias, pop-up ideals, collaboration, and long-term social engagement in Ontario, across Canada, and abroad. The conference will build on our previous conference, Homework: Infrastructures & Collaboration in Social Practices, in bringing together multidisciplinary artists and creative practitioners enacting and articulating the complexities of working in practices driven by curiosities about utopian collaboration, community, infrastructures, locality, and long-form social practice. With support from the Ontario Arts Council and Ontario Trillium Foundation, we’re looking to build an event that can frame a discussion on socially-engaged practices that span disciplines, with a particular focus on emerging practitioners. Since 1993, Jeanne van Heeswijk has been working on socially committed art projects that take place in public spaces. She sees herself as a mediator, an intermediary between a situation, a space, a neighborhood and the people connected to these. Acting, meeting, and communicating are key concepts in her method of working. She has coined the term “urban curating” for her interventions. In the sedate Dutch art world in which all taboos appear to have been broken, her work – uniquely – arouses fierce controversy. Darren O’Donnell is a novelist, essayist, playwright, director, designer, performer, Artistic Director of Mammalian Diving Reflex and Research Director of The Tendency Group, an emerging think tank and social policy laboratory. His books include: Social Acupuncture, which argues for an aesthetics of civic engagement and Your Secrets Sleep with Me, a novel about difference, love and the miraculous. In addition to his artistic practice, he is currently an Msci candidate in Urban Planning at the University of Toronto. Steve Lambert is an artist who works with issues of advertising and the use of public space. He is a founder of the Anti-Advertising Agency, an artist-run initiative which critiques advertising through artistic interventions, and of the Budget Gallery (with Cynthia Burgess) which creates exhibitions by painting over outdoor advertisements and hanging submitted art in its place. He has also worked with the Graffiti Research Lab and as a senior fellow with Eyebeam Open Lab. Ad Hoc, a panel organized by Thomas Provost, will feature panelists Kaija Wuollet, Elaine Carr, and Marcin Kedzior. An archaeology of the human world reveals there are infinite systemic exchanges constructing our environment: weathering, investments, labour, political forums, contracts, negotiations, among other occurrences and phenomena. Essential to this discussion on spatial-collaboration are the various exchanges a creative practice must navigate in order to create micro-utopias, pop-up-ideals, or projections of time & place. Within architecture and landscape, experimental operations have emerged despite an uncertain economic trajectory and forbearing ecological instability, under which our panelists curiously work, at least in part, ad hoc. Organized by Reena Katz/Radiodress, artist and Acting Director, Galerie SAW Gallery, Ottawa-Gatineau, Engaged to be Wary: De-authorizing Social Practice will feature panelists, Srimoyee Mitra, curator, Art Gallery of Windsor and Alana Bartol, artist and Project Manager for Neighbourhood Spaces, Windsor. At a time when community engaged art practices are becoming ubiquitous throughout gallery, museum and institutional education systems, there is a strong need for conversations around what works and what doesn’t in this growing and chaotic field. The goal of this panel will be to discuss diverse perspectives on Social Practice, ask critical questions, and formulate some useful guidelines for its successful pedagogy and praxis. We will use the opportunity of the publication to publish the beginnings of a malleable, living manifesta on the subject, based on the presentations, discussion and ideas generated at the panel. A discussion between Tities Wîcinímintôwak Arts Collective and Chris Rabideau will address themes such as intergenerational organizing, learning in the context of Two-Spirit, trans, and queer communities, and personal approaches to long-term, community-based work. This panel is organized by Maggie Flynn. The Shape of a Question: Art, Politics, Pedagogy, a panel organized by Michael Darroch and Jennifer Willet for IN/TERMINUS, will discuss historical and contemporary models and contexts at the intersection of art, politics and pedagogy. For a panel presentation on Saturday November 9, Michael Davidge has brought together a group of creative practitioners whose work addresses the themes of the Homework II conference through their engagement with electronic dance music. Davidge is an independent curator, artist and art critic who lives in Ottawa, Ontario. The panelists include Bambitchell (Sharlene Bamboat and Alexis Mitchell) (Toronto) who will present on their project, Border Sounds; Michael Caffrey and Kerry Campbell (Gatineau) who will discuss their “GhettoBlast Sound System;” and Chris McNamara (Windsor) will discuss his experience with the Windsor/Detroit techno music scene and describe his involvement with the audio collective “Nospectacle.” The panelists’ projects employ electronic dance music in various ways that construct, articulate, and practice ideas of micro-utopias, pop-up ideals, and long-term social engagement. “Support Someone Else’s Revolution” – The world is small, interconnected and formed from extensive systems that intersect with our lives. Knowingly and unknowingly our actions reinforce and resist the transformation of these systems, which do shift under the weight and energy of people and things. The Information Age is more a statement of societal arrogance than a reflection of a broader cultural understanding of the world. Gaps in knowledge exist and will not be rectified through the consumption of media nor exchanges within our personal networks. Department of Unusual Certainties has invited four individuals to speak to the ways that we support other people and things in transition (eg. corporations, neighbours and democracy etc.). Each of these four individual’s were selected because their practices empower citizens within stable States to reflect and then to act. The panel will feature: Michèle Champagne (Founder/Creative Director, That New Design Smell), Jordan Tanahill (Artistic Director, Suburban Beast), Satsuko Van Antwerp (Manager, Social Innovation Generation), and Justin Langlois (Director, Broken City Lab) moderated by Department of Unusual Certainties. A day of conversation, interviews, and workshops to inform the forthcoming publication. Join us and fellow conference panelists, attendees, and anyone else walking around the neighbourhood for some light breakfast. We’ll open our doors to serve cereal, fruit, coffee, and tea, along with some great conversations to kick off the final day of the conference. We’ll be back at the AGW for a series of workshops, discussion groups, and interviews that will help shape the forthcoming publication. We’re asking you to consider participating in the creation of this publication by conducting at least one interview with someone else attending the conference. Meanwhile, back at CIVIC Space, Hiba will be working to compile the content she receives from the participants — interviews, photographs, sketchbook notes, manifestos, endless questions, and more. An open community discussion on issues surrounding socially-engaged practices, the infrastructures required to support them, precarious labour, educational possibilities, the professionalization of artists, and the conference itself. The work continues at the AGW and at CIVIC Space towards compiling the contents for the publication, with follow up discussions driven by the General Assembly. 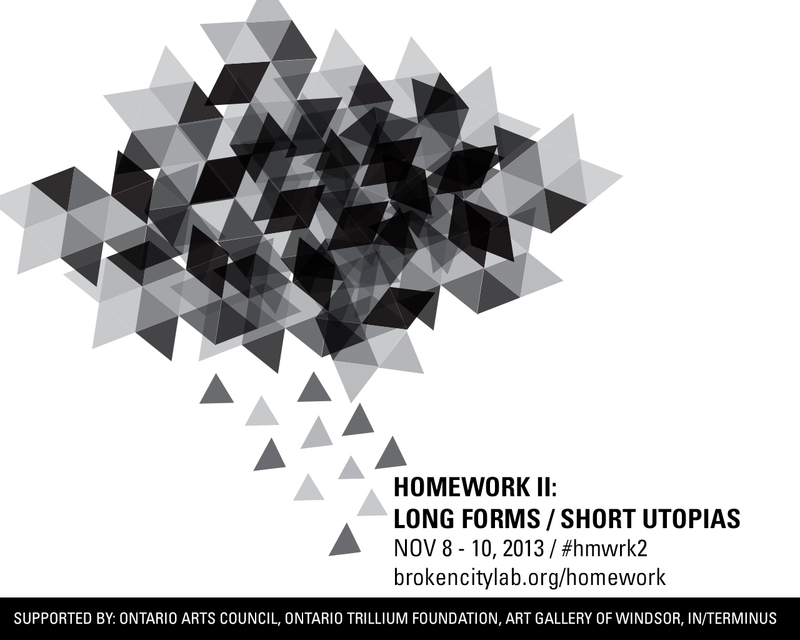 Homework II: Long Forms / Short Utopias runs November 8 – 10, 2013 at Art Gallery of Windsor, located at 401 Riverside Drive West, Windsor, Ontario and CIVIC Space, located at 411 Pelissier Street, Windsor, Ontario.